Say yah to da U.P., eh? 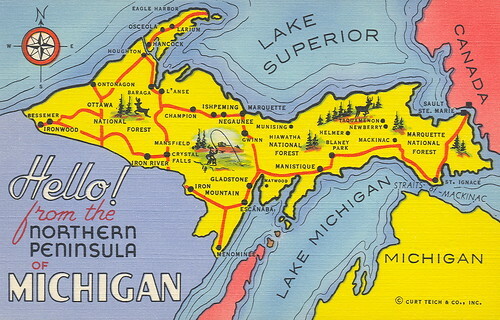 Next week the team at A Healthier Michigan is hitting the open road to explore all that the upper peninsula has to offer! From exercise in nature to eating fresh meals made with local fare, there are tons of healthy things to do in Michigan’s upper half. For five days, the AHM team will partake in many of them. The itinerary includes plans such as white water rafting on the Menominee River, hiking to Michigan’s highest point, Mount Arvon, and walking through the largest wooden dome in the world, Northern Michigan University’s Superior Dome. The team will have unique opportunities to preview local highlights that are not always available to the public. We will take a sunset cruise of the Pictured Rocks shoreline and visit remote parts of Sault St. Marie. One of the highlights of the weekend also includes the U.P. State Fair. On Blue Cross, Blue Shield of Michigan Day in particular, August 13, there are several health-focused attractions. Health screenings, craft tables for the little ones, a photo booth, cooking demonstrations and a Smokey the Bear birthday party/photo opportunity will all take place throughout the day. Health insurance 101 presentations will be available as well as different ticket raffles and giveaways. Admission to the fair is $8 per person, cash only, and runs August 11 through August 17. Perhaps the best part of the trip, will be the scenic drives to and from each location. It is easy to turn off your cell phone or computer, disconnect from stressful commitments and lose yourself in the beauty of the land. From crossing the Mackinac Bridge, to taking in the Porcupine Mountains, the U.P.’s most beloved attractions are the natural ones. We can’t wait to enjoy all things U.P. and share them with you! Be sure to follow the AHM team’s journey on Instagram, Twitter and YouTube. You can also track the trip with our #HealthyMe hashtag. What else do you love about Michigan’s upper peninsula? Are there any activities we left out? Let us know in the comments below! Oswold’s Bear Ranch near Newberry (south of Tahquammenon Falls). Waterfalls in Munising. Lighthouses. White Fish Point. Browns Fish House in Paradise. Tahquamenon Falls state park and Camp 33. Kitchitikipi springs. Seney National Wildlife Refuge. Brockway Mountain Drive. McClain State Park Houghton. Pictured Rocks. Hike the trails at Dead River Falls, go to the black rocks at Presque Isle and jump in the freezing cold water, hike up Sugarloaf Mountian out on 550 (stop at Phil’s 550 on the way for some cool souveniers), and check out the other turn-offs on 550, beautiful beaches and scenery galore! There is SO much to do but if you make it up to the Keewenaw Peninsula, head up to Copper Harbor and stop at the Jampot for all kinds of great treats! I’m clearly a Yooper at heart, ENJOY! Paddling opportunities abound along Lake Huron’s northern shore, where the Les Cheneaux Islands offer sheltered bays and channels for boating of all types. However, we are becoming best known for our excellent paddling waters that offer a wide range of excursions, from gentle to extended, and everything in between, with island destinations at Government Island and the Aldo Leopold Preserve on Marquette Island, just to name a couple. As you can imagine, paddling a canoe or kayak is an excellent upper body workout, and great whole-body exercise for the whole family.